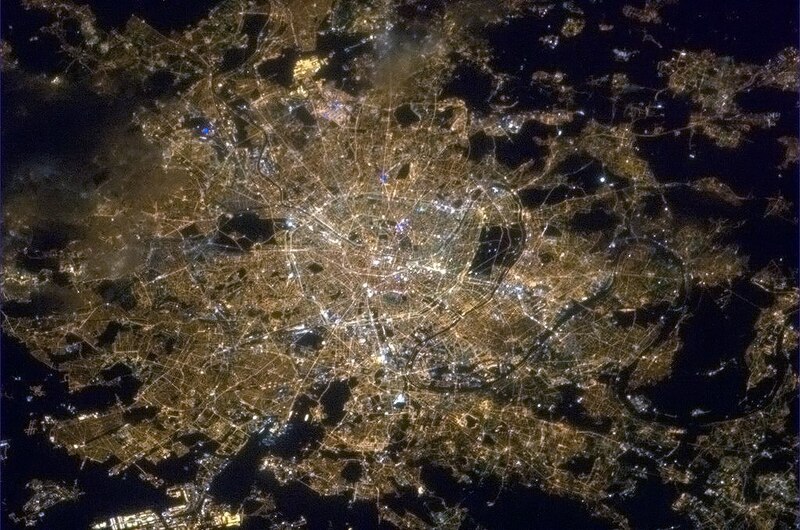 Here’s a photo of Paris city lights as seen from 250 miles above Earth on the International Space Station. Looking closely you can see a rough circle that marks “central Paris”, an area within the “Périphérique” freeway that surrounds Paris. The expanding spiral layout of central Paris, much like a snail’s shell, can also be followed by the light layout. The top of this photo is south and the bottom north, so Versailles is in the top right corner, Bois de Boulogne forest is the dark rectangle on the right, Bois de Vincennes the dark splotch left. Can you guess what is the brightest spot in all of Metropolitan Paris? (Bright yellow spot center top). It’s none other than… Disneyland Paris! Chris Hadfield, a Canadian astronaut currently onboard the International Space Station has been taking photos of cities by night.